« JibJab and StoryBots’ big Oct. 20 releases! How did you come up with the idea of this charmingly “cheesy” card? Ate a bunch of cheese before bed time! Do you enjoy cheese? If so, do you have a favorite? I’m actually lactose intolerant 😦 But back in my carefree consumer of Camembert days, I would have to go with a good ol’ squishy brie at room temperature. 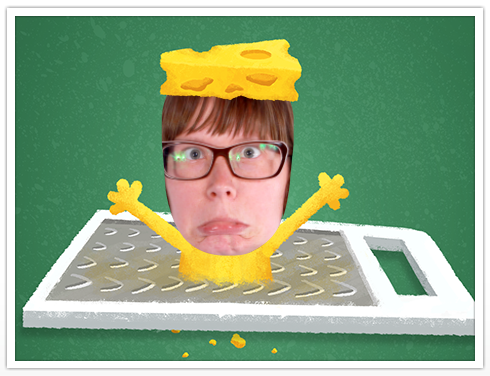 I miss cheese. What is a rocking thing one could do to earn a “you rock” eCard such as this in one’s inbox? Make your best friend a pizza. With extra cheese! With extra vegan cheese if they are lactose intolerant! Thanks, Meegs! Someone make her a vegan ‘za stat! And thanks for reading this lil’ Q&A, JibJabbin’ Blog enthusiast! Don’t forget to tell someone who rocks “YOU ROCK” today…! This entry was written by paulhanges and posted on October 28, 2014 at 11:13 am and filed under Behind the Scenes, Fun with the Site, Inside JibJab, jibjab. Bookmark the permalink. Follow any comments here with the RSS feed for this post. Trackbacks are closed, but you can post a comment. Who and how do you ask if you have a question befor giving my card number and joining? Like to know ince you pay the membership do you still have to pay for cards and or vedeoa?? Where do i go to ask ?? Hello Sharon, if you email help@jibjab.com I can help you out with this and resolve your concerns. Where can I find the HELP tab? I used to get my annual personalised jibjab card for free. Why is this no longer available? tool that allows you to create new posts using existing content (from article directories or other blogs from your niche)?